The Beguiled caused me to hold off on declaring Sofia Coppola as terrible a director as she is an actress, because for the first time I not only enjoyed one of her movies but saw the talent behind it in a very real way. It should be noted that the film is a remake and stars powerful actors who take complete charge, but Coppola still needs to lend a guiding hand, which she did, so bravo. 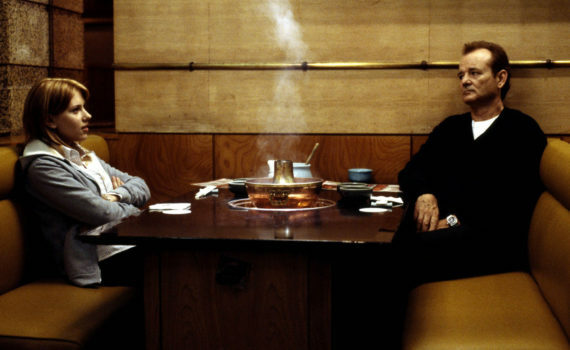 I decided to look back at her filmography in case I hadn’t given her enough credit in the past, and I was reminded of Lost in Translation, a movie I never really appreciated or cared for, when critics all around raved. So I gave it another shot, and while I still won’t call it a masterpiece, the style resonated with me much more now than it did 15 years ago. Maybe I have grown, maybe my taste level has, maybe I was in a different place, who knows, but I’m glad I want back, because this film packs an emotional punch I really appreciated. Bob Harris is an aging actor who is still known worldwide for his earlier films, and he finds himself in Japan getting paid a ridiculous amount of money to appear in commercials for a certain brand of whiskey. He’s also taking the job as an opportunity to get away from his real life for a while; the roles aren’t rolling in any more, his wife doesn’t want him around the house all day, and his kids don’t really need a father who is approaching being elderly. Bob needed a break to figure things out, so the timing couldn’t have been better, even if the stifling actions of the Tokyo support staff are driving him a bit insane. In the same hotel, young college grad Charlotte is feeling a lot of the same emotions; she married quickly and now isn’t sure that she made the right choice, following her photographer husband around wherever he travels but never feeling like she’s making her own decisions. She and Bob meet and begin to explore the city together, making a connection that will change both of their outlooks on life. I remember thinking that Lost in Translation was slow, and it is, but I don’t mind that so much now, when perhaps I did when I was younger. It’s a deliberate examination of human emotions and our need to connect with others, but also of our inability to find (or at least difficulty in finding) what makes us truly happy. Bob and Charlotte are both lost, find each other, help each other, and can walk away refreshed by meeting someone who is like them, by learning that they are not alone, and that’s a beautiful thing to watch. Coppola gets us there eventually, but it takes a while, and there are moments where boredom can creep up if you’re not being diligent. Johansson was so young in this movie, and she wasn’t her best, I’ve seen her do better, but I’m not sure I can say the same for Murray, who will blow you away with this layered role. He was hilarious and heartbreaking, the perfection combination of comedy and tragedy, and the film would probably have failed without him. But I’ll give Coppola some credit; she might not have been as mediocre in the past as I thought, and this story shows that. It might never reach the top of my List, but I understand this film more now than I did when I was 20, which I guess shouldn’t be surprising.